So, to continue my lucky streak, I thought I’d write about how lucky I was two week-ends ago when my husband watched all the boys while I flew half way across the country to see my sister. This was the first time that I’d been on a plane by myself since before William was born. With the exception of the previously mentioned creeps in Las Vegas, the whole week-end was wonderful. I went to pick up my sister at her home so that I could also see Delia and Joshua. Christina was also going to get a break, because her husband was watching her two older kids. Can I just say here how much I love the GPS. I put it in the bag and it made my driving in a brand new city completely stress-free! Also, how much do you love the silhouettes my sister made of her family?! My nephew usually keeps it real by never being too impressed by my arrival. Perhaps if I had brought his cousin he would have been a little more enthused! Doug’s sister lives about fifteen minutes from my sister so we stopped in to say a quick hello. I also got to meet baby Jett for the first time. She is actually preparing for her own sisters’ week-end in Seattle next month. You’ve got to love the Southwest sales! We stayed at a really nice hotel on the waterfront (thank-you Priceline). The best part of this place, besides the amazing view, was probably the free shuttle that dropped you off and picked you up anywhere downtown. We went to the market. It definitely puts any market that I’ve been to in Texas to shame. There was everything imaginable. There were lots of families, and couples. It seemed like it would’ve been a fun place to go on a date. I don’t know how comfortable I would have been with all three boys there; it seemed like there were a lot of places to hide! The best breakfasst potatoes ever! We spent most of Saturday shopping. We visited the flagship Nordstrom and of course we had some hot chocolate at Starbucks! Saturday night we went out for Chinese food and a Romantic Comedy. On Sunday morning I drove Christina home before I had to catch my plane. Before I dropped her off, we went for breakfast at Maltby’s which I think is in the town of Maltby, which is close to MillCreek. If ever you are in the Seattle area, it is worth the 40 min trip north to visit this place. I think they’re only open for breakfast on the week-ends, but they have, without a doubt the best breakfast potatoes … EVER! Also, the hot chocolate was just a lot of fun! This week-end was an excellent getaway for me. I think Doug and I should try it where we do a relaxing week-end away together, instead of going away separately. This is why we need family close by so that we can have someone to swap week-ends with! Don’t get me wrong, I love my kids to death, but Doug and I have not had a night away from all our kids . That is over five years. I’m making plans, because I came back super relaxed, but Doug was a little stressed because he had his first week-end all alone with the boys. One day we’ll coordinate our schedules! I don’t know what’s happening this week, but I also won some fabric today from QuiltTaffy. I actually won it a little over a week ago, but I just found out today. This is excellent. If only I was nominated for my Oscar this week … oh well, maybe next year. 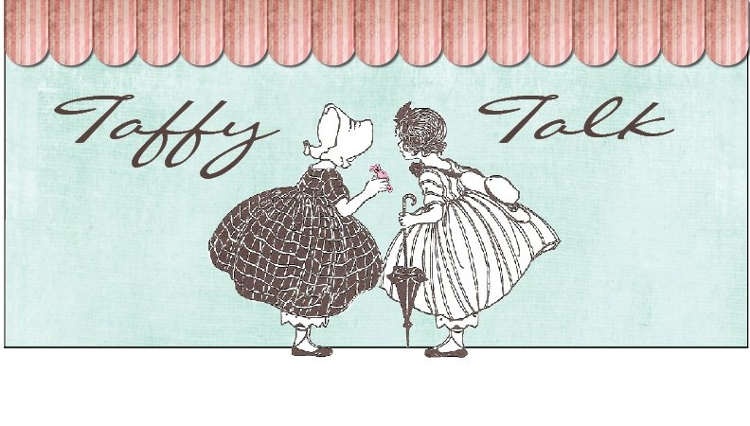 If you haven’t been to QuiltTaffy, you should check them out. They’re a great little quilting shop with some amazing fabric. They do a giveaway every Thursday, and they usually only have about 50 or so people enter, which should make your chances pretty good. Of course, who knows what will happen once all the readers of this blog get a hold of that site!! Alright, I’m off to go enter contests all over the internet. This could be my time!! I won a Design Mom random giveaway! I won’t go on and on about my 100 business cards because I don’t want to make you all extremely jealous of my good fortune, but if you’re curious, you can see what I won here. This might be the start of something for me!! I will post details about my super fun sisters’ week-end in a bit, but until then, does anyone recognize these two guys? I was in Las Vegas waiting for my flight to Seattle when I sat behind the two most obnoxious people I have ever come across (and let me tell you, I’ve come across some very obnoxious people in my day!) I wouldn’t normally think they were famous because we were in the Southwest terminal, but then I saw Scott Hamilton (who was in no way obnoxious) get off a Southwest flight. This was Vegas, so anything is possible, and I’m actually hoping these two were just really drunk, but you never know. Every single person who at near them got up and moved because they were so offensive. I cannot describe how offensive, but it was bad. I was just praying that they weren’t headed to Seattle. Thankfully, they were not, but I feel horribly for the passengers on their flight! Don’t worry, the rest of my trip went much better than the Las Vegas portion! So, I spent part of the week-end filling out my N-400 and then checking and re-checking the form. For those of you who were born in the US, the N-400 is the citizenship application. It is a bureaucratic tour de force. You need all kinds of things from the past five years, not to mention the fact that you have to convince the powers that be that you are not a “habitual drunkard!” It’s kind of a pain, which is why it has taken me so long. But, now that “change” has come to this great nation, I am ready! Well, I thought I was ready. As we were going over the forms last night for the umpteenth time, we realized that I had forgotten to use all capital letters. So, it was off to fill out the form again. Then there was the debate about how I qualify for citizenship. I qualify in two categories, but you can only use one, but which one is right?! Then came the kicker: Documentation. Proof of termination disturbed Doug to no end. He had to find out if he needed it. Here, I will elaborate: Proof of Termination is proof of termination of previous marriages. Now, I was a little perplexed because I have only been married this one time, and Doug has assured me that I am his only wife (therefore also his favorite), yet, he spent twenty minutes trying to make sure that there wasn’t a form for our particular situation. Doug is very concerned because this is the government, and this is my citizenship, so we want everything to be perfect. I’m a little less concerned with perfection, but that is a fault of mine! I would have probably mailed it off without capitalizing every letter, but then I probably would have been deported, so it’s good I’m married to Doug! Now, I am not making light of the whole application process. This is a very big step for me, and I’m very excited about my impending voting rights, but there has got to be some way to help out the process. Maybe these forms are all about weeding out the people who are to lazy to read all the instructions! Alright, I think I have about 18 months to wait to hear back, but it’s never to soon to start preparing myself for the citizenship test. Click on the link and see if they would let you be a citizen!